Every year, on the last week of November, ASIJ’s high school students take a break away from the classroom to explore, learn about, and experience a variety of cultural trips across Japan and in other parts of the world. 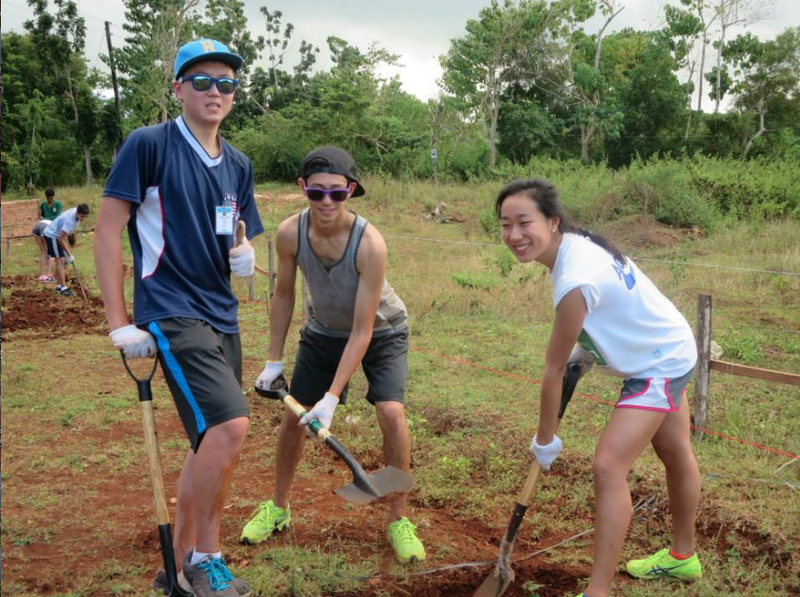 This year, the Habitat For Humanity club took a one-week trip to the rural area of Daanbantayan, on the island of Cebu in the Philippines. This area is one island east of, and at the same latitude as, Tacloban City, which was severely damaged during 2013’s devastating Typhoon Haiyan. We landed in Cebu City in the early evening on Wednesday,November 19, where we met our Filipino contact, host coordinator, and translator, Jeremiah Dalida or “JM” as we’d be calling him throughout the rest of the trip. After spending the following day sightseeing and touring around Cebu City, we made a three-hour drive up to the rural area of Daanbantayan. By the third day of our trip, we began to work on the designated site. Once everyone had arrived at the work site, JM briefed us with a quick orientation on our jobs and what to expect. Looking out at the work site, we found it was not a set of homes under construction, but rather a field marked off with string to show where future houses would be built. Our job was to begin the first task, which was getting the foundations of the houses ready. This of course, meant digging, and digging, and more digging. Digging trenches for the foundations may not sound like a complex job but it proved to be quite a challenge. The ground was composed of red clay and large, stubborn rocks. Due to the lack of electrical resources, there was no opportunity to use power equipment, so instead we had to use tools that looked like large ice picks to break up the rocks. The other native workers at the site generously provided us with all of the tools that we’d need, which also included long, pointed iron rods and shovels. While this was all fun, we needed a way to make sure that we were digging out the proper dimensions for the plots, so we employed “magic sticks,” which were cut from bamboo and measured out to roughly 20 centimeters. We’d use one of them to measure the depths and widths of the trenches. The other magic stick was used for our second task at the work site: building the frames of these houses. In this task, we had to work together to build the frameworks of the houses using pairs of long, slim iron rods, iron hooks and nails to help twist small, pliable metal pieces around the ends of the iron hooks so as to secure everything into place. As I write this, I am still in shock that the Habitat organization and the peoples of the affected communities would entrust a group of high school kids to piece together the frameworks of their future homes. The other portion of this building of the framework was trying to create the iron hooks ourselves so that our supply wouldn’t be so quickly exhausted. Towards the middle of our time in Cebu, we took a trip to see one of the communities that had been severely devastated by last year’s typhoon. It was for these families in this community that we were beginning the foundations of the houses. Afterwards, we also had the opportunity to visit a finished Habitat for Humanity work site so as to see what our site would eventually develop into. These finished houses were made entirely of concrete—Habitat’s first housing project to do so— rather than wood. Concrete is a better insulating material, helps to provide a feeling of air conditioning in the house and importantly can bear the weight of heavy roofs that will not blow away in future typhoons, as these finished houses had concrete roofs specifically designed to withstand higher winds in typhoon-prone areas. Everyone who we encountered gave us a warm welcome. At the work site, one local mother prepared lunches for all 30-plus of us every day; it was a real treat! We were able enjoy home-cooked dishes as well as fresh mangoes, pineapples, and bananas. The mangos were particularly sweet and fresh. Every day we were at the site, the local children would observe us work for hours at a time. Barefoot and occasionally without pants, these children started the week as very giggly and shy, bashfully smiling as they’d turn their heads away. As our time there progressed, they became increasingly extroverted, to the point where they’d go out of their way to photobomb each other’s pictures every time they saw a camera or an iPhone come out. They even, after a few days, decided that we needed help digging the plots and joined in. However, with children in the trenches, we could not use our digging tools, so we had them focus on one trench where we could also go over and work-play with them. Watching the children play, you could see that the entire field, the surrounding trees, the spider-filled bushes, everything around them became their playground. On our last day, we visited the local school and found that that the children who had been helping us were cutting class to do so. The teachers scolded the children in good humor and then allowed us to work with the students on different projects during the rest of that morning. At the end of our week, our Habitat for Humanity supervisors told us that we had dug out land for the foundations of six homes, which was much more than they expected. Although they have 10 workers on site, having 29 ASIJ students dig in for the week seemed to be sincerely appreciated and placed them ahead of schedule! *Author’s Note: At the time of writing, the Philippines will have just experienced its largest typhoon for 2014. Typhoon Ruby, (also known as Typhoon Hagupit) swept through the same area of the Philippines that had been severely damaged by Typhoon Yolanda (Typhoon Haiyan) in November of last year; Yolanda devastated the city of Tacloban and killed over 6,300 people. Damage from Typhoon Ruby is not yet known.